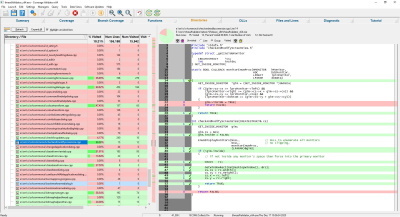 C++ Coverage Validator is a code coverage software tool for use by software developers and software quality assurance testers. 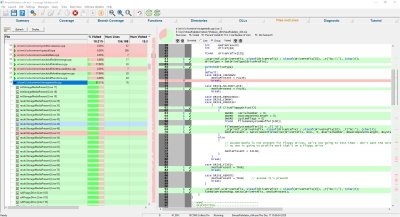 Determine code coverage for your software projects. Identify untested functions in your unit tests. 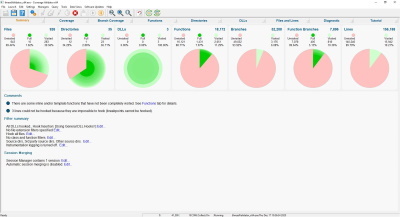 Improve your software quality testing with interactive, real-time, code coverage displays. 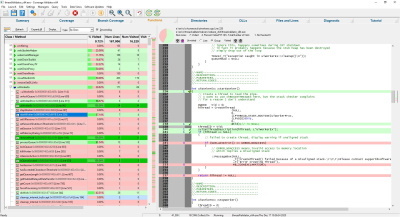 Merge code coverage data to provide aggregate code coverage results for all your unit tests. Command line API to support automated use (Jenkins, etc). Create coverage reports for your regression tests and overnight builds. Generate coverage reports at the same time as creating unit tests reports. 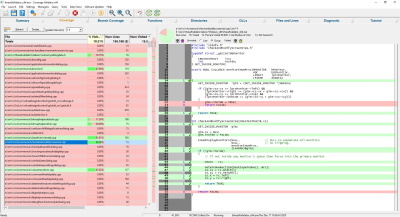 Interactive code coverage is a snap with C++ Coverage Validator. 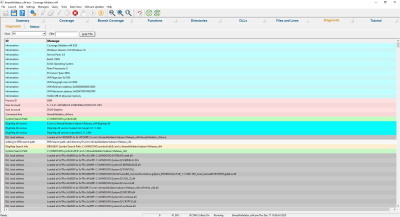 C++ Coverage Validator provides many displays to provide you with more insight into the data you have collected. To use C++ Coverage Validator all you need is debugging information for your application and C++ Coverage Validator can get to work. You do not need to modify your software, recompile or relink your software to use C++ Coverage Validator. Launch your application with C++ Coverage Validator. C++ Coverage Validator will launch and attach to your application. Run your application as normal. Examine the code coverage statistics that C++ Coverage Validator generates as your application runs. 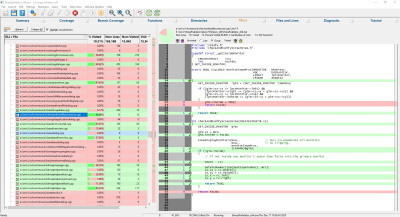 Easy to read data displays show you the code coverage as your application executes. You do not need to wait until your application has finished to view statistics for any function, file or DLL. The displays can be filtered to show you only the information that you want to work with. Detailed, colour coded source code shows at-a-glance which functions and lines have been visited and how many times each line has been visited. These displays update in real time as your application runs. C++ Coverage Validator can be configured to collect all data or just the data you need. Powerful filters for collecting data and for displaying collected data give you maximum flexibility and control over how much CPU time is spent and how much memory is used collecting data allowing you to choose how much effort is put into a given task. C++ Coverage Validator provides an API for using C++ Coverage Validator with services for the case when C++ Coverage Validator cannot inject into a service because of Windows NT security privileges preventing the injection (typically for services running at Administrator or system level). 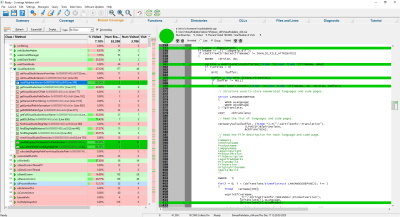 The default options of C++ Coverage Validator provide code coverage for all DLLs and files in your application that have debugging information. If you wish to only create coverage reports for selected DLLs, or exclude certain file types or even specific classes and methods, C++ Coverage Validator has filtering capabilities to allow such customisation. Sometimes however, there are sections of code that you would like to exclude code coverage statistics for but traditional filters cannot do the job. This is ofthe case when you want to exclude some error handling code from your coverage testing. C++ Coverage Validator allows you to include markers in your source code comments to indicate which parts of your code to exclude. In the picture below you can see that an ASSERT(0); has been excluded as has a for-next loop. C++ Coverage Validator provides powerful HTML and XML reporting capabilities, allowing you to produce overnight coverage reports if you use C++ Coverage Validator as part of regression testing strategy. We support many versions of Visual Studio: Visual Studio 2017, 2015, 2013, 2012, 2010, 2008, 2005, 2003, 2002 and Visual Studio 6 are supported. All 64 bit (x64) Windows operating systems are supported. All 32 bit Windows operating systems from Windows 10 to Windows NT 4.0 are supported. C++ Coverage Validator works with applications and services, both native and mixed-mode .Net. 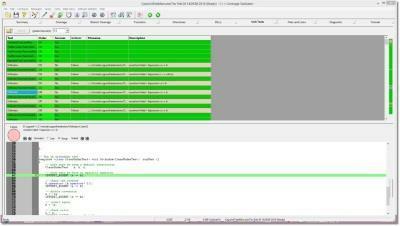 As well as the traditional code coverage role that C++ Coverage Validator performs, C++ Coverage Validator can be used for interactive code coverage testing and for creating code coverage reports automatically as part of a regression test suite and/or overnight build. C++ Coverage Validator also allows you to automate this process by launching C++ Coverage Validator from the command line. A full range of command line options allow you to perform unattended runs of C++ Coverage Validator, complete with HTML export, XML export and Cobertura XML export, to facilitate regression testing as part of your overnight builds.